CHICAGO (AP) — A day after a task force blasted the Chicago Police Department for decades of discrimination, law enforcement officials weighed which of the panel’s recommendations could be adopted and how much they might add to Chicago’s already heavy financial burdens. The only thing that was clear about the group’s 190-page report was that it can’t be treated like critics say like previous studies were — shoved into a desk drawer and forgotten. 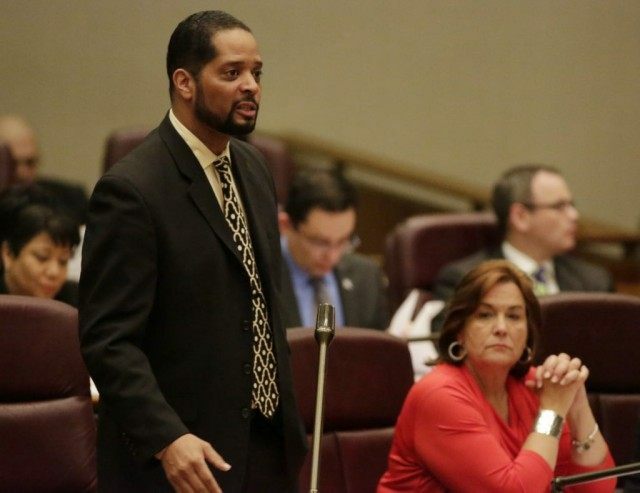 “Either we act now and do the right thing or the Department of Justice is going to mandate that we turn and do the right thing,” Alderman Anthony Beale said, referring to a separate review of Chicago police practices being conducted by the federal government. The task force created late last year by Mayor Rahm Emanuel portrayed the Chicago department as a place where racist officers have been able to hide behind rules and procedures and police brutality was easily kept secret. Chicago officers have “no regard for the sanctity of life when it comes to people of color,” the panel’s report said. The report issued Wednesday also offered a list of suggested reforms, including increasing the number of body cameras and posting complaints against officers and their discipline records online for everyone to see. The Justice Department launched a civil rights probe of the police force in the wake of the November release of a video showing a white officer firing 16 bullets at black teenager Laquan McDonald, killing him. That investigation will almost certainly result in another list of proposed changes that can’t be ignored. That is what the city of Ferguson, Missouri, learned after a similar Justice Department probe into the death of Michael Brown Jr., the black 18-year-old whose fatal shooting by a white officer helped launch the Black Lives Matter movement. The Ferguson City Council rejected as too expensive a Justice Department plan that included hiring a monitor and outfitting all officers with body cameras, only to back down when it was hit by a federal lawsuit. How much might it cost? In much smaller Ferguson, for example, the Justice Department’s measures were estimated to require well over $2 million over three years. “We’re clearly talking about millions of dollars,” Lightfoot said. But, she noted, millions are being found “every month, every year” to pay for legal settlements and court judgments involving people who were mistreated by police. Police misconduct has cost the city $660 million since 2004 — an amount that dwarfs the price tag of all the recommendations put together, Lightfoot and others agree. The task force recommendations call for creating several positions, including an inspector general and deputy police chief. Those roles offer salaries of at least $170,000. Chicago’s financial woes include the worst-funded employee pension system of any major city in the U.S., and massive deficits in the public school system. Emanuel recently pushed through a huge property tax increase and other new fees, warning that the only alternative would include severe cuts to police and fire services, recycling programs, pothole repair and even rodent control. The department is already doing some of the things the task force recommends, including offering training for officers in de-escalating encounters with people in the throes of a mental health crisis. Fifteen percent of Chicago’s 12,000 police officers have already completed what is known as crisis intervention team training. The task force suggests increasing that to 35 percent. To see how other ideas might be adopted, Chicago in some cases need only look as far as the suburbs. DuPage County already has a so-called Smart911 system, which allows households to create a safety profile with information about family members with mental health problems or other medical issues. The profile pops up during 911 calls and allows dispatchers to give responding officers detailed information before they arrive on the scene. The system costs the county about $145,000 a year. The task force report said such a system might have prevented a deadly encounter in December in which a white police officer shot and killed a 19-year-old black college student who called 911 for help. The hardest part of turning the report into reality may not be paying the cost but making sure everyone from rank-and-file officers to political leaders embraces the change, Lightfoot said. The difficulty of that was evident when Alderman Edward Burke stood at Wednesday’s City Council meeting to explain why the council should vote to settle for $1.5 million the lawsuit filed by the family of a man who died in police custody after suffering an asthma attack. Witnesses, Burke said, described how officers refused to allow Justin Cook to use his inhaler after he was arrested and handcuffed. One witness, he said, shaking his head, told of seeing an officer spraying the inhaler into the air as he told the gasping Cook that he should have thought about his asthma before he ran from them.